SimPL (Simulation Platform Creator) is a contents management system (CMS) for building your own thematic materials design platform. The present version of SimPL is available at the SimPL homepage. Many thematic platforms are to be developed for various materials design issues, such as solar cell materials design, nano sensor design, nano membrane design, etc. Based on our previous experience with Virtual Fab and iBat Platform, we developed the easy-to-use platform development kit using the plug-ins of various modeling and simulation functions. 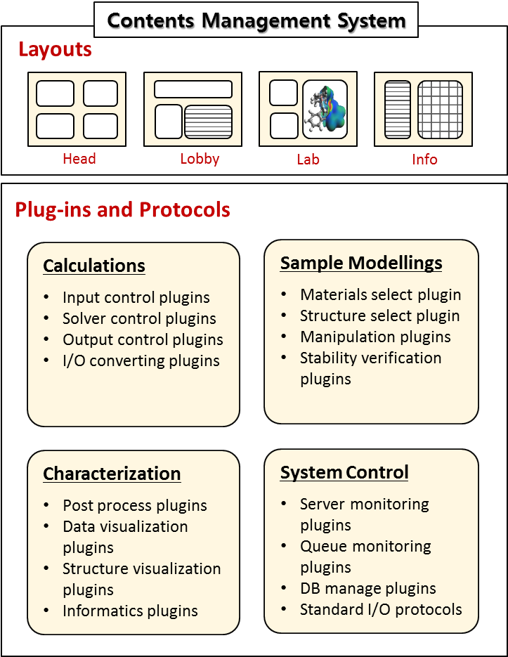 The plug-ins of following four categories are integrated in the SimPL package. Advanced computation methods, informatics tools and visualizers will be further added. Please keep eyes on SimPL homepage.